This past Sunday this cutie turned FOUR! We began the morning in a rush by being at church at 7:30 a.m. I made cinnamon rolls-his request and we were out the door! M and G came to last church service and then we all left to eat lunch. After lunch, he opened his presents from us. He is by far my easiest kid to buy gifts for. He likes everything! We played and rested for a bit and then it was PARTY TIME! Andrea made the cutest dinosaur invitations. I decided to have the part at Play Street Museum. If you're local, you should check it out! It's a cute little play place that's open for free play during the week and birthday parties on the weekend. My favorite part about it is the place is crazy clean! The lady working was fabulous during the party and so helpful! It was great. Seriously, can't say enough nice things about Play Street. A few months before Bowen's party, I heard about a local restaurant, Top Dog Tacos, that caters. A FB friend had them cater a birthday party and they brought the cutest little hot dog cart. I contacted them and was so glad I did. They were also great to work with! They brought a hot dog cart, all the toppings, drinks, and chips. They made my job SO easy! This kid was stoked about hanging with all his friends! The week before Thanksgiving I ordered a few dinosaur decorations to help make it a little more festive. The hot dog area...they even made a specialty dog for Bowen's big day (for the grown-ups). This girl had to be dragged out of this little ice cream shop! She had a blast playing the entire time! Everyone was too busy playing to pause for a picture. 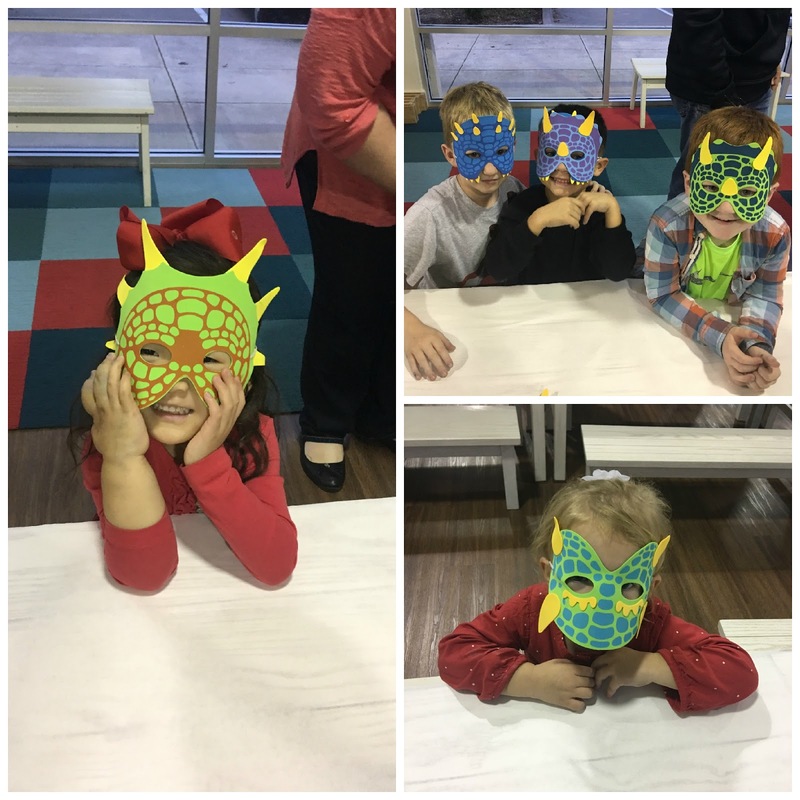 We had cute little dinosaur masks on the table for everyone. Do you recognize any of these dinosaurs? I cannot believe he's FOUR! What a cute little place! It looks like the big boy enjoyed himself! Love the dinosaur theme too! Love the party idea! It looks so fun but so simple for you too! And a hotdog bar for dinner? Sounds like every kid's dream! Happy birthday, Bowen! What a perfect party for Bowen! And the hot dog cart sounds so fun!!! What a fun party! Looks like he had a fun day! We had so much fun at Bowen's birthday party! I cannot believe our guy is FOUR!!! Insert my ugly cry HERE! We love Bowen so much!!! Looks like Bowen had a great birthday! LOVE the hot dog cart! What a great little party! Happy birthday Bowen ! Happy Birthday to Bowen! Play Street and a catered hot dog bar make one great party! Way to go, mom:). Bowen and Ashby are going to grow up and get married. I just know it! LOL...seriously, they are so cute together. Love your poncho at Bowen's party? Mind sharing where you got it? Happy belated birthday to your boy. Looks like he had a fun party. Those invites are super cute.